EscapeMaker.com, NYC’s guide since 2000 to local getaways, opens the first ever pop up shop dedicated to agritourism, local farm, winery and brewery getaways, running March 31st-April 24th within the historic Fulton Stall Market at the South Street Seaport. Presented by Amtrak, the EscapeMaker Pop Up Shop located inside the Fulton Stall Market on 207A Front Street will be open to the public Thursdays and Fridays (12:00pm-6:00pm) and Saturdays and Sundays (11am-5pm), March 31st through April 24th. Visitors can pick up info on green travel, farm escapes, apple picking, wine and craft brew trails and local getaway packages to inspire them to start planning their vacations. Drawing a 250-mile travel radius around New York City, EscapeMaker offers getaway ideas within a few hours of New York City by car or by train with a focus on farms, wine and brew trails and culinary tourism. The shop and events presenting sponsor is Amtrak, encouraging taking mass transit to local vacation destinations to lower one’s carbon footprint. Agricultural sponsors include The New York Apple Association, Vermont Tourism of Vermont and Dutchess Tourism, Westchester Tourism, Corning & the Southern Finger Lakes, Sullivan County Visitor’s Association and the Long Island Convention & Visitor’s Bureau – all within New York State. 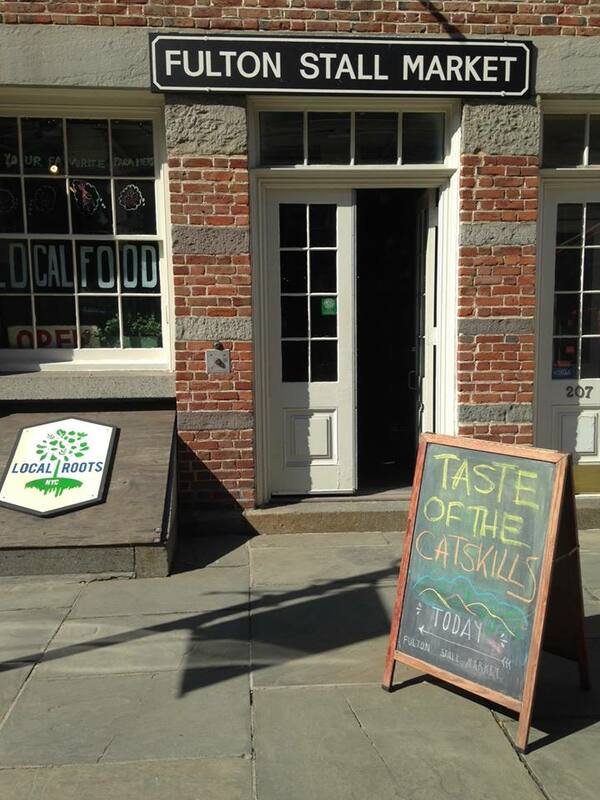 In conjunction with the regular FSM farmer's market around the corner on Little Water St., all events run from 11am-5pm and will feature food and beverage samples from local producers, live music, presentations by local farmers, winemakers and brewmasters and information on local vacations, where to go apple picking and visit a farm! After five years of hosting a one-day Local Food & Travel Expo that focused on green getaways, the first of its kind in the country, EscapeMaker’s founder, Caylin Sanders, wanted another challenge. “A pop up shop was a natural transition for us. Our annual expo in Brooklyn drew thousands of people and was very successful, but we decided that the 1-day format of a consumer food and travel show was too limiting, ” says Sanders. “People want to sample food and wine and to support their local producers, but they also want to connect and share their travel experiences, bring their kids and families, as well as actually book weekend getaways with knowledgeable experts. This new venue gives us the opportunity to create that community dynamic,” comments Sanders. EscapeMaker’s Pop Up Shop serves as a promotional program of the Fulton Stall Market, an initiative of the South Street Seaport District. 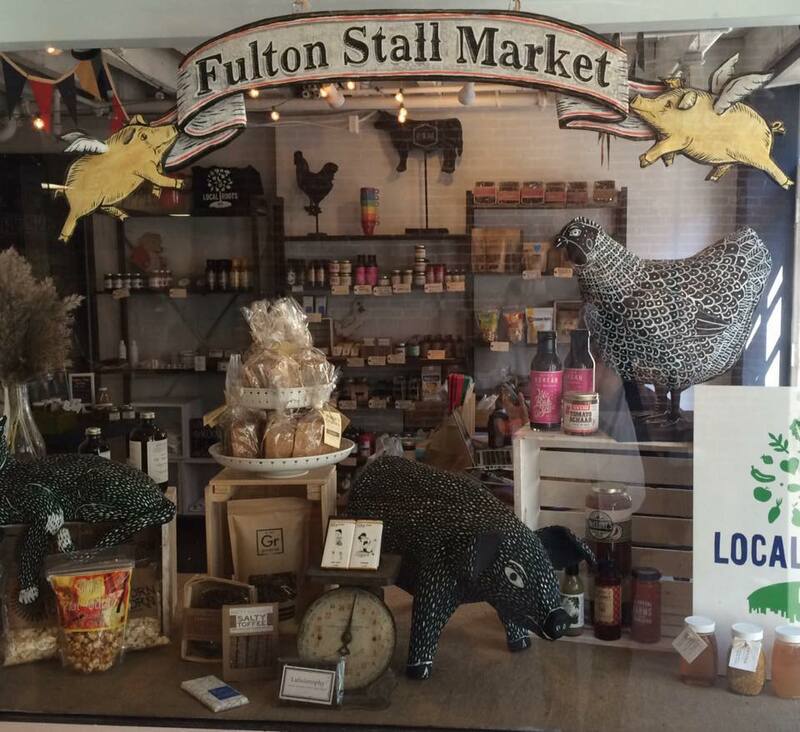 Fulton Stall Market at 207 Front Street, is a marketplace for local foods connecting farmers and producers with the growing Lower Manhattan community. Located in the historic district, where the City's markets began in the 1700’s, it’s a first step toward development of a year-round indoor public market for New York City featuring local products and educational programming celebrating the Seaport District’s vibrant market history. Already the market has been offering educational programming and a CSA to local residents through partner Local Roots. Passersby can also tour the new photography exhibit, “Organic,” based on the book by Francesco Mastalia. Twenty-one striking black and white 10-foot daguerreotype oversized photos of Hudson Valley farmers line the building around Beekman and Front Streets. Each photo features a scannable QR code that links viewers to EscapeMaker.com and more information on how to visit or buy from them. Bob Lewis, Fulton Stall Market’s lead consultant comments, “It’s exciting to not only put our farmers and producers in the context of agritourism but also to be able to offer quality family-friendly events to our neighbors and Seaport community." After April 2016, EscapeMaker’s agritourism tents can once again be found stocked with local getaway information in Union Square and various outdoor Greenmarkets in Manhattan and Brooklyn as part of a marketing partnership, solidified earlier this year with GrowNYC to promote Greenmarket farmers with on-site farm stores and experiences and local agritourism destinations. EscapeMaker’s new website is also slated to launch in Summer 2016.